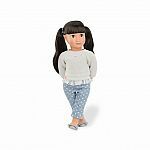 We simply adore these dolls, outfits and accessories for their detail and variety. Brimming with personality and style, these charming girls can share clothes and accessories with any 18"doll—just like real friends do! And Our Generation goodies are so affordable, it's easy to build a whole world where the play date never has to end.